His recording career lasted only six years, his spell at the top of his profession barely four, and he was only twenty-nine when a life of excess caught up with him. But in that brief span, Hank Williams created one of the greatest bodies of work in American music. Songs like "Your Cheatin' Heart" and "Hey, Good Lookin'" and "Jambalaya" sold millions, crossed over from the country to the pop charts, and became the model for all country music that followed. But by the time of his death, Hank had drunk and drugged and philandered his way through two messy marriages and out of his headline spot on the Grand Ole Opry. Even though he was country's top seller, toward the end he was so famously unreliable that he was lucky to get a booking in a beer hall. Drawing on years of impeccable research and powerful first-person accounts to create the most full-blodded portrait of Williams ever, Hank Williams: The Biography is a masterful account of Hank Williams's stunning rise and spectacular decline. It discards the myths to reveal a driven, disorderly life, one that swung between unimaginable success and unutterable miseries. He was raised by a woman who alternately lavished affection on him and made unreasonable demands. His impoverished childhood sent him onto the streets of Montgomery, Alabama, to earn money, first by selling peanuts, later by singing. He left behind a stormy home life for an even stormier marriage to a would-be singer who grew increasingly embittered by Hank's successand by his drinking and endless touring. That marriage ended in a nasty divorce, and the next began in a media circus, a public wedding in an auditorium with spectators paying to watch. Just weeks after his second marriage, his life spiraled out of control, finally leaving Hank dead in the backseat of his Cadillac on New Year's Day 1953. This biography unfolds Williams's life and times in telling detail, with extraordinary attention to the music that is his legacy. It also reveals much that was previously unknown or hidden about Hank Williams's life, including his songwriting collaborations, his crippling degenerative illness, and the first full account of his final journey. In trying to conjure up something that would sell a few records, Hank Williams laid bare his sould and efined the vernacular of contemporary country music. The generations of fans who have loved that music will find here a compelling and accurate portrait that will stand as the definitive biography. Colin Escott is the author of the critically accalimed Good Rockin' Tonight: Sun Records & The Birth Of Rock & Roll. 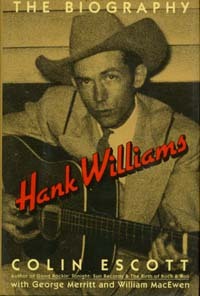 He produced and annotated the CD collection "Hank Williams: The Original Singles Collection. . . Plus" and works as a consultant to several record companies. George Morris grew up in Montgomery during the 1940s and is an acknowledged expert on Hank Williams's career. WIlliam MacEwen has made a study of Hank Williams's life, and is also recognized as one of the experts in the field.